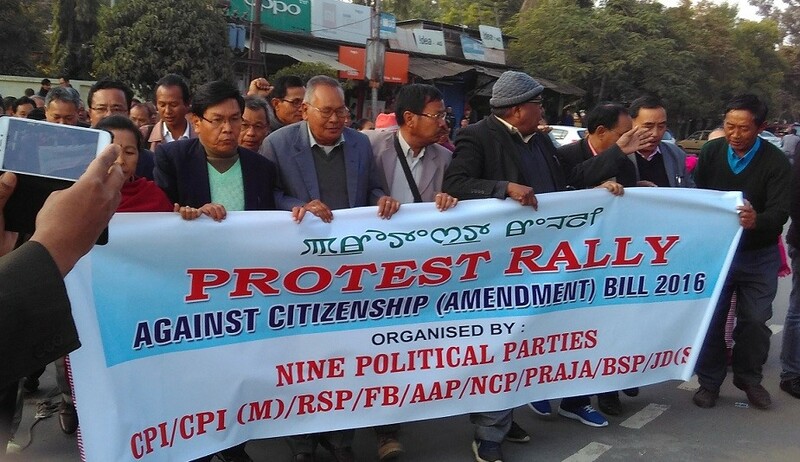 Representative file image of protest against Citizenship Bill in Northeast. The Union Home Ministry on Tuesday clarified that the religious minority people coming from Bangladesh, Pakistan and Afghanistan need to fulfill certain criteria before they were given Indian citizenship. The statement from the Ministry of Home Affairs (MHA) came against the backdrop of raging controversy and protests in Assam and rest of the Northeast over granting citizenship to the migrants from neighbouring countries by enacting Citizenship (Amendment) Bill, 2016. “There should be a procedure. They have to fulfill some criteria and once they fulfill the criteria the concerned state government will send recommendations to the Union Home Ministry for granting citizenship,” said Ashok Prasad, spokesperson in the MHA. Prasad is of the view that there is a “miscommunication” and “misconception” over the Citizenship Amendment Bill. “People who seek to get Indian citizenship have to ascertain their place of origin as well as they have to prove that that were the victims of religious prosecution,” said Prasad. The home ministry official also ruled out that the migrants will be settled in Assam and northeast only. ‘All the states will take the responsibility,” said Prasad. According to the government records, people from the six religious communities who entered India before December 31, 2014 following religious prosecution in Bangladesh, Pakistan and Afghanistan should be given Indian citizenship. The Bill has already been passed in the Lok Sabha triggering a huge unrest in northeast especially in Assam. The anti-BJP political parties as well as several student organisations mainly All Assam Students’ Union (AASU) have rolled up their sleeves in their tirade against the Citizenship Bill.